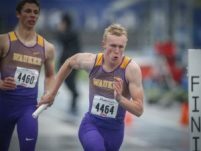 The Waukee High School (WHS) boys and girls track teams were busy last weekend at the 108th running of the Drake Relays. 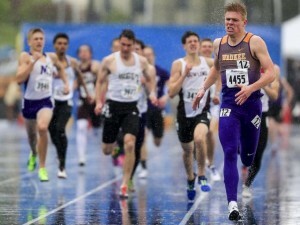 Rain, temperatures in the low 40’s and wind did not slow down the Warriors as both teams were highlighted by a relay title and individual champions. 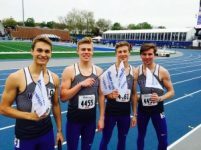 The two programs combined to win 48 Drake medals during the three-day event. In addition, the WHS boys team won the coveted HyVee Relay Cup and the WHS girls finished second in the Cup standings by just one point. Individually, Kat Moody and Josh Andrews won championships. Moody outdistanced her teammate, senior Morgan Nealey, by just one inch (43’10” to 43’9”) to win the Shot Put. Andrews broke away from a tight pack to win the 800 meter run in a time 1:55.63. WHS teams are traditionally strong in the relays and this year was no exception. 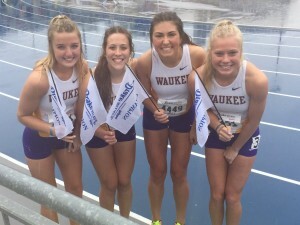 The Waukee girls team of Sydney Winger, Mary Gray, Lauren Nelson and Hannah Schau won the shuttle hurdle relay for the 4th time in the last 6 years and, in the process, broke the Drake Relays and Iowa All-Time records winning in a time of 1:00.95. The WHS boys team of Carson Doty, Josh Andrews, Tyler Groathouse and Ryan Modlin won the 4×800 relay in a time of 7:56.94. Waukee just missed bringing home three more first place trophies. The girls placed second in the 4×100 relay losing by .01 seconds. The boys had narrow misses in two relays losing the 1600 Medley by .01 seconds and the 4×400 relay by just .08 seconds. The two teams now set their sights on the conference, state qualifying and state meets during the last three weeks of the season.